Hundreds of people have attended a candlelit vigil in memory of Ben Kinsella who died a week ago. Ben, 16, was stabbed in York Way, Holloway, north London, after a row, which began at a bar in North Road nearby, spilled on to the streets. 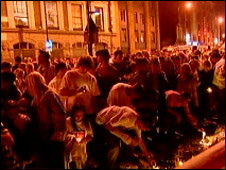 A minute's silence was held outside the Shillibeers bar on Sunday at 0200 BST, the time Ben was stabbed to death. Three men - two aged 18 and one aged 19 - are due to appear at the Old Bailey on 13 October charged with his murder. Another 18-year-old has been bailed to return to a London police station in mid-August while enquiries continue. Ben's sister, former EastEnders actress Brooke Kinsella, who played Kelly Taylor, was among those who attended the emotional vigil in North Road, Islington, north London. The event, which was publicised through website Facebook, saw well-wishers laying candles and lanterns alongside the many bouquets of flowers that have been left at the scene. One of those present, Caroline Benford, wrote on Facebook: "What a beautiful ceremony - everyone give yourselves a pat on the back for holding it together for Ben's sake. "Well done it was very moving and all you youngsters should be so proud of how you behaved." Another vigil attendee, Diane Lewis, added: "What a lovely memorial, I'm so glad we attended. RIP Ben. May your star shine bright." On Tuesday, up to 400 protesters marched in Upper Street, Islington, to the scene of the killing to demand an end to knife crime. At the scene of his death the gathering chanted "What are we here for? Ben. Why are we here? No knives." 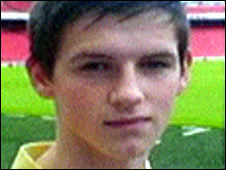 Ben was the 17th teenager to be stabbed or shot to death in London this year. Another teenager, Shakilus Townsend, became the 18th, after being stabbed to death in Thornton Heath, south London, last Thursday.